CARFAX Certified 1 Owner - No Accidents - Fully Serviced - QUALITY CERTIFIED up to 10 YEARS 100,000 Miles WARRANTY This Chrysler includes: 300 PREMIUM GROUP Fog Lamps Keyless Start Remote Engine Start Integrated Turn Signal Mirrors HD Radio Navigation System Power Mirror(s) Rear Parking Aid Back-Up Camera Universal Garage Door Opener Satellite Radio Blind Spot Monitor Premium Sound System Cross-Traffic Alert BLACK, LEATHER TRIMMED BUCKET SEATS Leather Seats Bucket Seats ENGINE: 3.6L V6 24V VVT (FFV) Flex Fuel Capability V6 Cylinder Engine TRANSMISSION: 8-SPEED AUTOMATIC 845RE (STD) 8-Speed A/T Transmission w/Dual Shift Mode A/T GLOSS BLACK *Note - For third party subscriptions or services, please contact the dealer for more information. 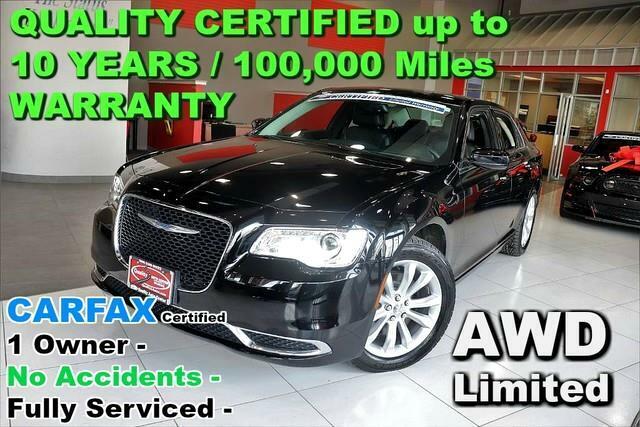 * The CARFAX report for this 2015 Chrysler 300 Limited - AWD - CARFAX Certified 1 Owner - No Accidents - Fully Serviced - QUALITY CERTIFIED up to 10 YEARS 100,000 MILE WARRANTY highlights that it's a One-Owner vehicle, and for good reason. A One-Owner vehicle gives you the feel of owning a new vehicle without paying the new car price. When the Chrysler 300 Limited - AWD - CARFAX Certified 1 Owner - No Accidents - Fully Serviced - QUALITY CERTIFIED up to 10 YEARS 100,000 MILE WARRANTY was created, it was automatically enhanced by having the performance ability of all wheel drive. Not only will you notice improved steering and superior acceleration, but you can also rest easy knowing that your vehicle comes standard with increased stability and safety. Exceptional in every sense of the word, this incredibly low mileage vehicle is one of a kind. Added comfort with contemporary style is the leather interior to heighten the quality and craftsmanship for the Chrysler 300 You can take the guesswork out of searching for your destination with this Chrysler 300 Limited - AWD - CARFAX Certified 1 Owner - No Accidents - Fully Serviced - QUALITY CERTIFIED up to 10 YEARS 100,000 MILE WARRANTY's installed Navigation system. How often was the oil changed? Were important service intervals taken care of? You'll have the records on this vehicles to know for sure. Pre-owned doesn't have to mean used. The clean interior of this Chrysler 300 makes it one of the nicest you'll find. Drive away in this amazing Chrysler 300 and enjoy the realization of having the manufacturer's factory warranty coverage still in effect. The incredible 2015 Chrysler 300 Limited - AWD - CARFAX Certified 1 Owner - No Accidents - Fully Serviced - QUALITY CERTIFIED up to 10 YEARS 100,000 MILE WARRANTY is an invigorating performance machine that will pump adrenaline into any driver who dares to take the wheel. Do you really need any other reason to want one? This highly refined Chrysler 300 comes with exciting features you'd expect in a vehicle twice the price. You know the the previous owner washes and polishes the vehicle with great care and detail? It's in impeccable condition. Sophistication, performance, style and class all wrapped up in this rare Chrysler 300. More information about the 2015 Chrysler 300: The 300 presents a luxury big-car design and style at an affordable price. The car retains its Audi-like appearance and presence, but features prices starting around $30,000. The lineup of powerful engines and available all-wheel drive mean the 300 also has performance credibility to match its style. Inside, a comprehensive list of standard equipment as well as safety technology means the 300 competes above its class in both features and price. This model sets itself apart with comfortable ride, available all-wheel drive, luxury-style interior touches, roomy interior, and Athletic V8 engines No Credit / Bad Credit / No Paystubs, No problem !! ! All Approved ! Everyone drives ! CLEAN, GORGEOUS, LOW MILES, SHOWROOM CONDITION. CALL NOW QUALITY CERTIFIED up to 10 YEARS 100,000 MILE WARRANTY , To Certify a vehicle, there will be an additional cost for Certification. CALL NOW For details. STUNNING AGGRESSIVE LOOK ON THIS BEAUTIFUL--Call today to schedule a test drive... Good Credit/Bad Credit/No problem!!!! Get paid cash? No problem!! 100% Credit Approval with interest rates starting at 2.49% for qualified customers, our rates will not be beaten. We price our cars at wholesale price to guarantee the best deals for our customers. Our inventory moves quick, please call to confirm the availability of the vehicle of your interest Springfield location 973-564-0112. This vehicle is located at our SPRINGFIELD location. Come visit our new showroom in Springfield NJ. Quality Auto Center is honored to present a wonderful example of pure vehicle design... this 2015 Chrysler 300 Limited only has 34,409mi on it and could potentially be the vehicle of your dreams! Enjoy the comfort and safety of this AWD Chrysler 300 Limited equipped with many standard features found on other vehicles as optional equipment. One of the best things about this Chrysler 300 is that it has low, low mileage. It's ready for you to truly break it in. Beautiful color combination with Black exterior over Black interior making this the one to own! More information about the 2015 Chrysler 300: The 300 presents a luxury big-car design and style at an affordable price. The car retains its Audi-like appearance and presence, but features prices starting around $30,000. The lineup of powerful engines and available all-wheel drive mean the 300 also has performance credibility to match its style. Inside, a comprehensive list of standard equipment as well as safety technology means the 300 competes above its class in both features and price. This model sets itself apart with comfortable ride, available all-wheel drive, luxury-style interior touches, roomy interior, and Athletic V8 engines No Credit / Bad Credit / No Paystubs, No problem !! ! All Approved ! Everyone drives ! CLEAN, GORGEOUS, LOW MILES, SHOWROOM CONDITION. CALL NOW QUALITY CERTIFIED up to 10 YEARS 100,000 MILE WARRANTY , To Certify a vehicle, there will be an additional cost for Certification. CALL NOW For details. STUNNING AGGRESSIVE LOOK ON THIS BEAUTIFUL--Call today to schedule a test drive... Good Credit/Bad Credit/No problem!!!! Get paid cash? No problem!! 100% Credit Approval with interest rates starting at 2.49% for qualified customers, our rates will not be beaten. We price our cars at wholesale price to guarantee the best deals for our customers. Our inventory moves quick, please call to confirm the availability of the vehicle of your interest Springfield location 973-564-0112. This vehicle is located at our SPRINGFIELD location. Come visit our new showroom in Springfield NJ.